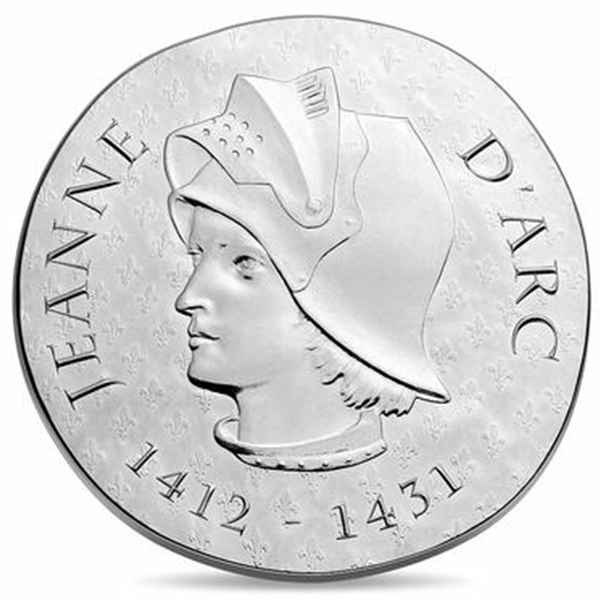 The 2016 France Joan of Arc 10 Euro silver Proof coin pays homage to the female military leader who rattled English intruders in France and paid the ultimate price for it. Joan of Arc (Jeanne d’Arc) was a peasant girl born circa January 6, 1412 to Jacques d’Arc, a tenant farmer, and Isabelle Romée in Domrémy, Duchy of Bar, France. Raised a devout Catholic, at the age of 13 Joan believed that God called her to rid France of the English, who had occupied northern France and forced many of Joan’s fellow villagers from their homes in the Hundred Years’ War. Joan endeavored to reach Crown Prince Charles and convince him of her divine mission to liberate France. He, in turn, provided an army to Joan, who led a victory against Anglo-Burgundians from their strongholds and saw Prince Charles become king. Joan was taken captive during an assault in the town of Compiégne and tried on some 70 charges, including witchcraft. She was released upon signing a confession denying the divine origins of her calling, but she disobeyed the terms of her agreement by wearing men’s clothing and was sentenced to death. Joan on Arc was burned at the stake on May 30, 1431. Her name was cleared 20 years later and in 1920 was declared a saint by the Catholic Church. The Joan of Arc 10 Euro silver Proof coin is the third issue in the multi-year Women of France coin series, which each year honors three important women in French culture and history. The Proof coin, minted by Monnaie de Paris, contains .713 ounce of .900-fine silver. 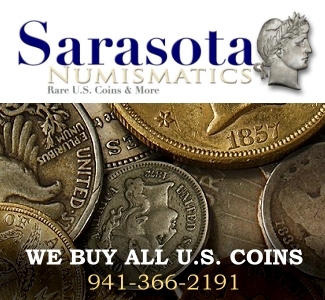 The coin is broadstruck, which imparts an irregular round shape that resembles the look of hammered ancient coins. 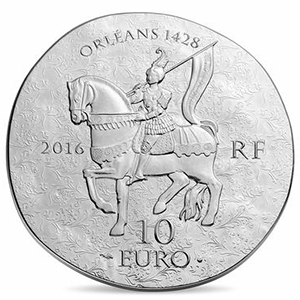 The obverse of the 2016 Joan of Arc 10 Euro coin depicts a left-facing profile of the young heroine in her battle helmet. Her name is inscribed in its original French, JEANNE D’ ARC, across the top of the coin and dual at the bottom center is dual dated with her birth and death years, 1412-1431. The background of the coin is ornamented with a pattern of textured fleurs-dis-lis, which decorated her white ceremonial flag. On the reverse, an armored Joan of Arc is seen mounted on her horse during the siege of Orleans in 1428. She and her horse, its front left leg raised in the air, face left and are surrounded by various inscriptions. These include ORLÉANS 1428 at the top center, which identifies the location of battle and the year signified by the reverse design. On the center right of the reverse are the letters RF, which serve as the initials for Republique Francaise. At the bottom center of the coin, under the central device, is the coin’s denomination 10 EURO in two horizontal lines of text. The denominational inscription is flanked on the left by a cornucopia, the Monnaie de Paris mintmark; on the right is a small pentagon that serves as the trademark for Mint Director Yves Sampo. The left of the coin bears its date, 2016. The reverse fields, meanwhile, are textured with a floral pattern. 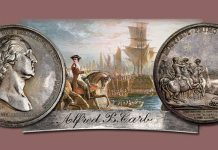 The 2016 Joan of Arc silver coin has a smooth edge.